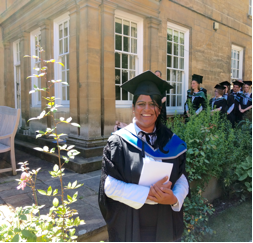 Louis Dreyfus Scholar Nidhi Singh (MSc Law and Finance) reflects on her year spent with the Weidenfeld-Hoffmann Trust in Oxford. Like any other ambitious student across the world, I too had nurtured a dream to study in one of the best institutions in the world. To some it may come easy but to others it may take some time. But the ultimate truth is that it will come to everyone who has the ability to defend his/her dreams. My journey of getting into Oxford has been quite unique. I got into Oxford, every year from 2012 to 2015, but I kept on either deferring or declining the offer until I was awarded a full scholarship in 2015. Never ever had I thought that this journey could be so exciting and life changing. I owe this experience to the Weidenfeld-Hoffmann Leadership and Scholarships Programme and the Louis Dreyfus Foundation. Settling in Oxford can be intimidating at first, given that you feel you will be competing with the best in the world. Oxford as a University has so much to offer that any international student can very easily be lost for a few months trying to figure out its ways. The MSc course only lasts one year, making it all the more challenging for a student to fit into the system and to understand the rules of the game quickly. But it is from here that I learnt one of the most important lessons of my life: time management. Oxford will teach you how to manage and balance academic life along with your social life. I was admitted to one of the most challenging courses at Oxford: the Masters (MSc) in Law and Finance (MLF). However, it would be wrong to suggest that other courses here are less rigorous, because Oxford tests your creativity and brings out the best in every student. The environment is deliberately very academically challenging, but ultimately everybody learns, given the supportive environment that it offers. Coming from a law background, I initially struggled to understand the bits of economics and finance in my course, but ultimately the support classes and tutorials helped me ace these subjects. Oxford makes you think! This is the best part of being in Oxford. What I liked the most about studying here was the tutorial and seminar method of teaching. The tutorial essays are highly demanding and the seminars are very engaging, which kept me on my toes. I had to be prepared and do my homework before every class. This helped me to understand even the most difficult of concepts. Even before I started my course at Oxford University, I began my journey at this place with a Louis Dreyfus Scholarship for the Weidenfeld-Hoffmann Scholarships and Leadership Programme. I consider myself very privileged and honoured to have been a part of this intelligent and outstanding cohort of scholars coming from various parts of the world. I was admitted to Oxford with a couple of scholarships, but I chose the Louis Dreyfus Weidenfeld-Hoffmann Scholarship as there was a leadership training component attached, which made it unique among the scholarship available at Oxford. I thought this would add value to my degree and to my personal development. At the end of the year, I can say that I am not disappointed with my decision. The leadership training imparted through a series of Moral Philosophy seminars is different from the traditional form of training in leadership. Learning about various types of thinkers and their approaches to reforming society added a new and diversified perspective to my knowledge of law and society. Throughout the year, the scholars had the opportunity to listen to renowned speakers in the field of law, politics, finance, economics, history and public policy. The programme also comprised skill development and practical training sessions in CV writing, job applications and interview, op-ed writing and exam writing techniques. All this added to my holistic development during my time at Oxford. The year ended with a Leadership Forum which I felt was the cherry on the cake of the entire training program. The Leadership Forum gave me an opportunity to interact with speakers from different professions and engage with them on the current issues of policy-making processes. The scholars were also given training in public-speaking skills, which helped me build both a useful set of techniques but also, crucially, the confidence required to be an effective speaker. Apart from funding my entire stay and study at Oxford, courtesy of the Louis-Dreyfus Foundation, the Weidenfeld-Hoffmann Scholarships and Leadership Programme has added such important attributes to my personality, which I believe no other programme so well structured could have contributed to my life. At the end of my term at Oxford, I feel more empowered, confident and extremely positive to bring about a promising change in this world. (14) In the end, we need an enabling state to carry out the reforms. There is a need to accelerate project implementation for shared prosperity in any nation across the globe. The forum ended with a visionary thought: If you want to travel fast, travel alone. But if you have to travel far, travel together. Need of the hour: How to travel fast and far? 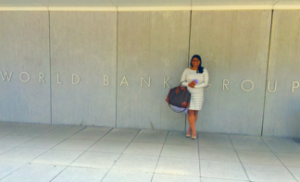 Nidhi at the World Bank Headquarters in Washington, D.C.
Last year, I won the Best Essay Prize at the Oikos Model WTO organized in collaboration with Universitat de St. Gallen and World Trade Organisation (WTO), Geneva. The prize gave me an opportunity to pursue a specialised course in Investment Law under the International Economic Law Programme (IELPO) at Universitat de Barcelona, Faculty of Law in May 2016. I had the privilege of being taught by Prof. Robert Echandi, Investment Policy Global Lead, Trade and Competitiveness Global Practice, World Bank Group, USA. 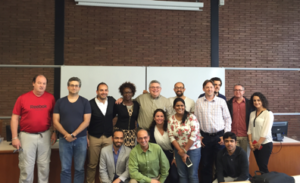 The course gave me immense exposure both in terms of content and peer group. 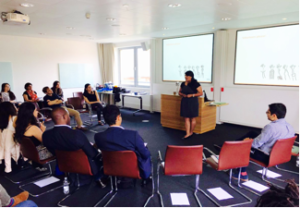 The class comprised Senior Investment Policy Analysts from the World Bank Group and students of the IELPO programme. This added to the diversity and made the course more interesting and challenging. As a participant, I had the opportunity to learn about the historical origins, political economy and key legal instruments regulating international investment, focusing on the analysis of the core element and guarantees included in international investment agreements. As Louis Dreyfus Weidenfeld scholars, we are expected to carry out a pro bono project either in the home country or abroad as part of the requirements of receiving the scholarship. I decided to conduct my pro bono work with the Kalinga Institute of Social Sciences (K.I.S.S.) in Bhubaneswar, Odisha. The NGO has been listed as one of the top 500 NGOs of the world by the NGO Advisor, Geneva and has also been granted a special consultative status by UN-ECOSOC. KISS is the largest free residential educational institution for indigenous children in India. Starting with only 125 children in 1993, KISS has since developed rapidly to its current state, providing education for 25,000 children in 2015 alone. KISS now has the ambitious goal of educating 2,000,000 poor indigenous children over the next decade. As a volunteer, I studied the work of K.I.S.S. and helped them prepare a report on their work being done and as to how they are helping in achieving the UN Sustainable Development Goals (SDGs). After studying the work, I co-authored a paper with Dr. Achyuta Samanta and Dwiti Vikramaditya (Senior Adviser to K.I.S.S. ), and submitted to the UN International Conference on Sustainable Development (ICSD) for consideration, which now has been selected for presentation at the Columbia University, USA (September 2016). With only few selected invited speakers, the ICSD represents both a competitive and high profile platform for discussions on sustainability. The Weidenfeld Scholarships Pro-bono component encouraged me to participate in the social sector that helped me appreciate my role and responsibility as an individual towards the society. I am very thankful to Dr. Achyuta Samanta and especially Dwiti Vikramaditya who allowed me to study the work of K.I.S.S. and gave me the freedom to think and conduct my research in most unbiased manner. The Scholarships & Leadership Programme is part of the Weidenfeld-Hoffmann Trust.